Parishes that are under the oversight of a member of the Council of Bishops of The Society are invited to affiliate to The Society. Further details may be found here. 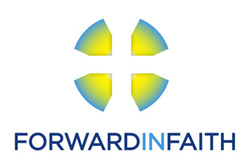 Parishes that are affiliated to The Society may register with Forward in Faith for no extra charge. This entitles them to representation in the Forward in Faith National Assembly and to discounts on advertising in Forward in Faith publications. Parishes that are affiliated to The Society are listed on the Society website. The diocesan lists can be accessed from this page. An interactive map of Society churches is available here. These four websites are not managed by Forward in Faith. Queries about them should be directed to their respective webmasters via their Contact pages. Many Forward in Faith parishes advertise in New Directions, and some more fully in our Adverts section. Forward in Faith parishes are asked to pray, and keep a candle burning, for the work of Forward in Faith. A free laminated candle card can be obtained from the Forward in Faith office.